San Francisco just did something Seattle couldn’t manage: on Election Day, they voted to tax big business to fund homelessness relief. Like Seattle, San Francisco is a tech city whose rising costs have pushed people out of the area and out of their homes. Also like Seattle, the community asked big business to pay their fair share. Unlike Seattle, they listened. Proposition C puts a gross receipts tax between 0.175 percent and 0.69 percent on businesses with more than $50 million in gross annual receipts, which would affect companies like Twitter, AirBnB, Uber, and Google. The expected revenue of $250 to $300 million will go to funding permanent housing, mental health services, and short-term shelters for people experiencing homelessness. Part of the momentum that led this proposition to pass came from Salesforce CEO Marc Benioff, who came out in support of the tax despite the almost $10 million in additional taxes that will be owed by Salesforce. “Homelessness is all of our responsibility,” Benioff says. Our community has been shirking that responsibility. With an approximated 8,500 people experiencing homelessness in Seattle, the city is in an accelerating crisis. Passing a person experiencing homelessness on the street is about as shocking to Seattleites today as rain. This rapid increase is not an isolated circumstance. The factors that leave thousands of people without homes (largely cost of living outpacing wage growth paired with insufficient public supports) are side effects of booming urban economies across the United States. While a booming economy is a good thing, one that leaves people behind isn’t. Ours has left thousands behind in the name of tax savings for big businesses and wealthy individuals- but it doesn’t have to be that way. It’s clear that Seattle’s current infrastructure to support people experiencing homelessness is insufficient. We see a great need for permanent affordable housing, beds in shelters, mental health resources, and basic medical care. A reasonable tax burden on our high-earning corporations could answer this need. But you might remember things going a little differently with the Head Tax this past summer. When Seattle City Council unanimously approved an employee hours tax to fund homeless services in May, big businesses (in particular, one well-known online retailer) leapt to action. The Head Tax would have charged $275 per employee on businesses earning more than $20 million a year, and would have generated $47 million toward ending Seattle’s homelessness crisis. Despite Seattle’s increasing cost of living and rates of homelessness showing a direct correlation with Amazon’s rise, Bezos sent the clear message that he thought it wasn’t his problem. 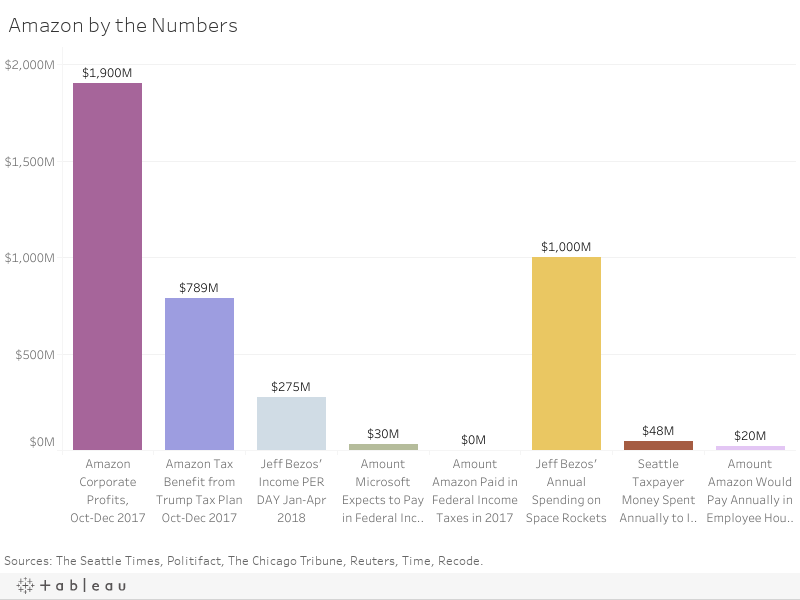 Amazon halted construction on a building, threatened to leave Seattle, and funded the No Tax on Jobs repeal campaign to avoid paying 0.26 percent of its profits to fund necessary homelessness services. Correlating with Amazon’s growth, King County rents have increased 53 percent in the last 5 years. In King County, every 5 percent increase in rent puts 258 more people on the street, and 93 percent of people experiencing homelessness in King County did not come from elsewhere, but were instead pushed into homelessness within their own communities. One in every 13 children in Seattle’s public school system is homeless. LGBTQ youth and people of color are disproportionately likely to experience homelessness. Despite all this, Amazon’s power was felt and its interests were prioritized. The head tax was repealed. Benioff’s use of his platform and his funds to advocate for the Yes on C campaign contributed enormously to the ultimate passage of the proposition. It’s not to say that other tech companies didn’t pose fierce opposition, or that the voices of community members didn’t pave the way, but interests of individuals like Benioff and Bezos have a disproportionate influence on political decisions that impact all of our futures. For better or for worse, the wealthy get their way, and they have the power to catalyze change. Should such individuals follow Benioff’s example and assume membership in the communities they’ve made their home, they can save and improve thousands of lives and alleviate systemic suffering. The only price tag is shouldering a fair share of tax contributions. Addressing these issues now will actually save everyone money in the long-run. We can’t expect outcomes for people experiencing homelessness to get better on their own, and we can’t be surprised if rates continue to increase because greater action is not taken. We need revenue to fund necessary programs to address the systems that create homelessness. Homelessness services, accessible healthcare, and affordable education are all within reach if those earning big paychecks, both businesses and individuals, pay their fair share in taxes. If anything is to change in our city and state, this is an essential first step that will benefit each of us. Instead, for the time being, we get to watch San Francisco do what we couldn’t. And while I know Washingtonians don’t want California to win, we should celebrate their accomplishment. Prop C still has a long road ahead, but it shows an important paradigm shift in corporate responsibility and community solidarity. We in Seattle should strive for the same, and should continue pushing our lawmakers and corporations to follow suit.